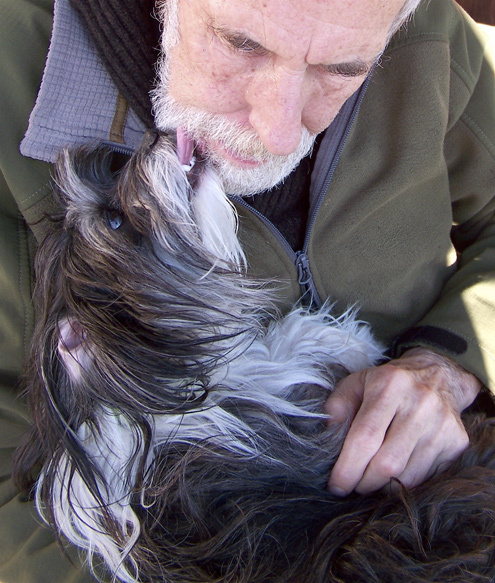 The ad manager of The West Marin Citizen, Linda Petersen, a week ago asked Lynn and me to take care of her Havanese dog Eli for three days while she was away. Lynn and I had done so before, and since Eli is a fun dog, we readily agreed to take him again. 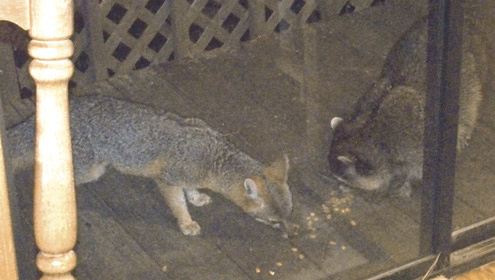 Although he’s almost always inside the house when foxes arrive on the deck each evening, for three days Eli managed to drive them off with his barking. 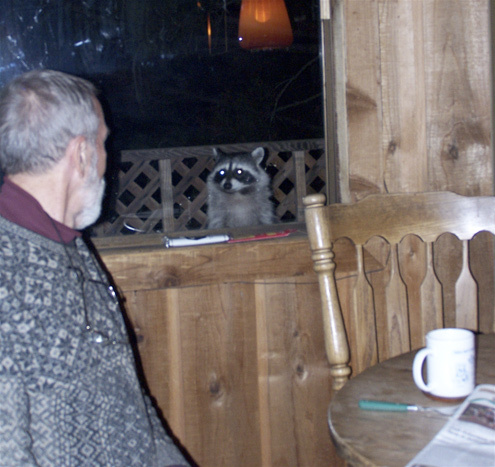 The raccoons, however, were more nonchalant and stood outside the kitchen’s glass door looking him in the face. Eli’s big adventure of the weekend occurred after I had let go of his leash and he discovered a flock of wild turkeys in my pasture. Barking as he ran, Eli scattered the flock. 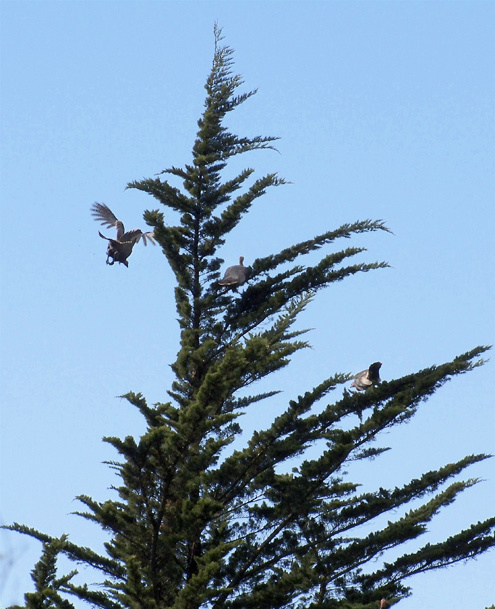 Most of the turkeys flew across a small canyon while several others flew to the top of a fairly tall pine tree. I had never before seen a turkey on the wing make such a steep climb. Once Eli was gone, the foxes felt safe in returning. Ironically, eating nose to nose on my deck with one or more raccoons bothered them less than being on the deck when Eli was inside this glass door. Most wild animals on this hill act as if my cabin were my cage. 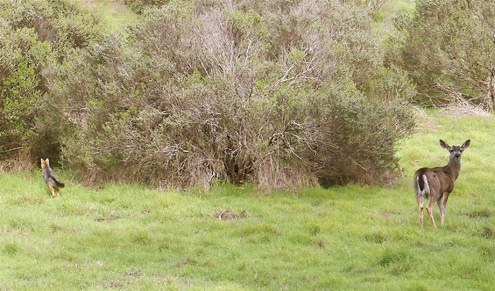 The moment I get out of it, they get skittish — the foxes more than the deer, as can be seen. 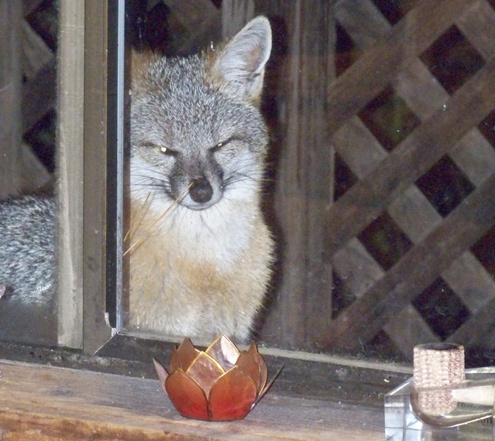 When I’m inside, however, foxes feel comfortable coming up to the door even when it’s open. 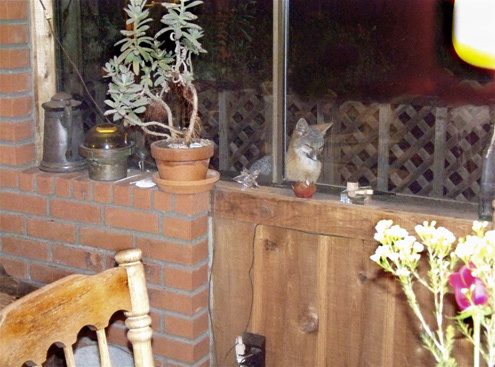 A fox sits on a woodbox outside my dining-room window and surveys the dinner table. Is a fox shy or fierce? It’s ironic that we tend to think of foxes as shy. Their reputation was much fiercer in the past. There is a legend about a hungry boy in ancient Sparta who stole a fox he intended to eat. When the boy encountered some soldiers, he hid the stolen fox under his tunic and answered their questions. Although the fox was chewing into his stomach, the boy endured the pain without flinching to avoid being exposed as a thief. Sparta, of course, had its own code of conduct. In Greek legend, the boy was not dishonorable for stealing the fox but admirable for his stoicism. Unlike Eli, I’m on generally good terms with the foxes. I can hand feed them slices of bread, but I’m not about to scratch their bellies or let them clean my beard. 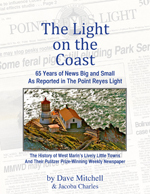 Sparsely Sage and Timely is powered by	WordPress 4.9.10 and delivered to you in 0.392 seconds using 54 queries.